Permanent Speed limit road traffic sign. Made from durable aluminium. Conforming to the new European road sign standard BS EN 12899-1:2007. 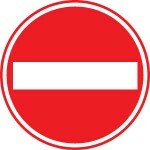 Permanent No Through Road / Dead End road traffic sign. Made from durable aluminium. 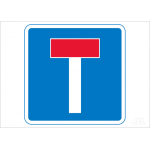 Conforming to the new European road sign standard BS EN 12899-1:2007.